Private care home uniform doesn’t always have to be a classic healthcare tunic; there are ways you can brighten up your uniform whilst ensuring your clothing is infection compliant. From the traditional healthcare blue to shades of purple, you can improve the ambience of your care environment by your work uniform choices. Why consider a new care uniform? Wearing a care worker uniform that resembles a typical hospital uniform can make residents in a care home feel uncomfortable and create a sterile living environment. Moving away from this and considering a care home uniform that is more neutral can create a more approachable appearance for your residents and their families. At Simon Jersey we have several different healthcare uniforms including options that would be suitable for a care home environment, or even a mobile carer who visits service users in a variety of environments. 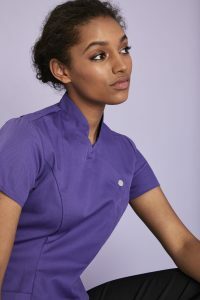 The Simon Jersey press stud tunic is a popular workwear item from our beauty uniform department that is made from the same infection control compliant fabric as our classic Simon Jersey healthcare tunics. It features a concealed zip fastening and a double action back for ease of movement, offering the same practical features as a healthcare uniform but with less of a medical appearance. The press stud tunic is available in 12 different colours including hot pink and cobalt blue, which could be a great colour palette for your business. The press stud carer tunic suits a variety of job roles within your facility, and because of the number of colours available, it can be utilised to differentiate between members of staff. For an example of role structures determined by colour uniform, carers could wear a royal purple, your cleaners a graphite and the reception team could wear a plum shade. You don’t have to stick to medical colours such as navy and white, and by wearing a bright uniform you can lift the spirits of your residents creating a happier environment for everyone. Although our linen tunics are traditionally also used in the beauty industry, there’s no reason you can’t take them on as your care uniform. The lightweight material is perfect for carers who are on their feet all day, keeping you and your team cool in hot environments, and the easy-care properties make laundering less time consuming. There are four different styles of linen tunics to choose from including the V-neck, button front, wrap and tie. The style could be chosen depending on the type of care being given. If working with children, you might prefer the V neck tunic, but if you work with the elderly you may want something sleeveless like the wrap, so nothing catches while assisting them. If you required, we also carry a male V-neck linen tunic in black, navy and grey which will keep a unified image across all your team. The linen tunics are the perfect combination of comfortable and practical, which is key for employees who are constantly on the move, and pulls away from the standard style of uniform in favour of something more fashionable. Our keyhole, side pocket and shaped neck tunics would make the perfect carer uniform as the style of all three lends well to the practical requirements needed of this particular workwear. The simple design of each tunic will ensure daily tasks can be carried out easily and comfortably. All three come in four different colours, so you could choose teal for a pop of colour or grey for a classic workwear look. They are short sleeved, and because of the minimal design, they will look good on every member of staff. Our carer’s tunics can be embroidered with your logo and staff names to really make it unique to your business. It also helps residents to get familiar with who’s who and means they don’t have to try to remember names and makes staff easily recognisable for visitors to the home. We offer a fantastic embroidery personalisation service which will help you to customise your carers uniforms effectively. You can find everything you need to build your perfect care uniform on the Simon Jersey uniform website, including our exceptional carers uniform range and healthcare uniform department. If you need any extra help or advice when choosing workwear for yourself or your team, please do not hesitate to contact our customer services team on 03444 994414.